Founded in 2018, Singularity-X is based in the European Union and offers individuals and institutions the ability to trade digital assets such as Bitcoin, Litecoin, Ethereum, and DASH. Singularity-X is a Lithuania-based cryptocurrency exchange that gives individuals, as well as institutional companies, access to trade cryptocurrencies such as Bitcoin, Litecoin, Ethereum or Dash. Both crypto/crypto and crypto/fiat trading are available, with trade pairs available in USD and EUR. Additional cryptocurrencies and tokens are expected to be gradually added in the next months. Creating an account at Singularity-X is as easy as typing in your email address, a password and specifying your country of residence. After this, you should receive an activation link to your email address, which you will you have to click to finish the activation of your account. Once your email has been confirmed, you will need to complete your profile and verify your identity before you can begin trading. Singularity-X provides a simple, clean user interface for cryptocurrency traders so you can stay focused on your positions. The exchange architecture has been designed by a Match-Trade, a professional team with extensive experience in building financial trading platforms. The exchange matching engine can process 20,000 trades per second, thus providing a fast, smooth order execution. 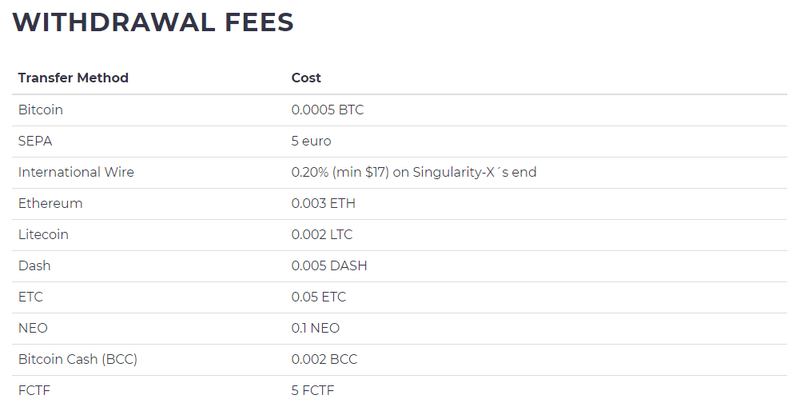 Currently, there is a very interesting promo at Singularity-X as it is possible to trade BTC/EUR with NO trading fees at all. Also, a distinctive trait of this exchange is that you can trade First Crypto ETF (FCTF), a token that allows traders to simultaneously gain exposure to 10 digital assets. Singularity-X supports cryptocurrency as well as SEPA and international wire transfers. Singularity-X requires additional user information before any deposits or withdrawals can be made in order to meet KYC/AML legal requirements. Once you have fully verified your profile with the required documents, you can deposit any amount of cryptocurrencies and up to 15,000 USD/Euro daily / 200,000 USD/Euro Monthly. Regarding withdrawals, you can withdraw cryptocurrencies for a value of 25,000 USD/Euro daily / 300,000 USD/Euro monthly. In the case of fiat money, limits for withdrawals are 15,000 USD/Euro daily / 200,000 USD/Euro monthly. The security of digital assets at Singularity-X is guaranteed by a combination of hot and cold wallets. Only a small portion of the crypto-assets is kept in a hot wallet, with the remainder safely stored in a cold wallet. Although Singularity-X is a newcomer to the crypto-exchange scene, it looks like a promising choice for European customers willing to trade cryptocurrencies. The platform is very intuitive, which makes it ideal for beginners. 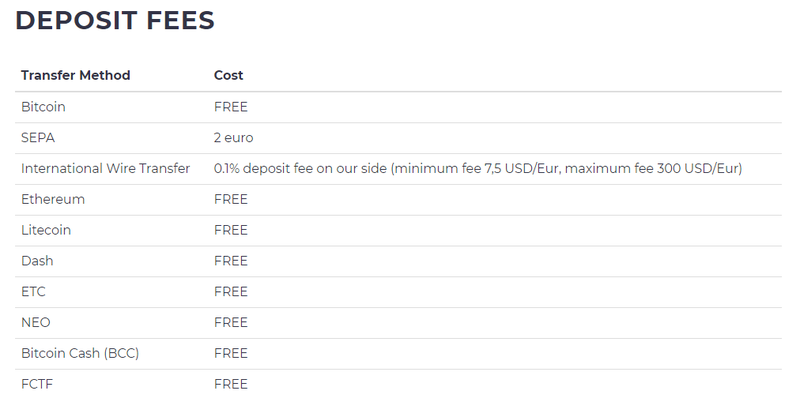 The fees that are charged are reasonable, especially considering that you can trade BTCEUR for free. In addition, most of the funds are held safely on cold storage. If we had to find a drawback, an Android/iOS app is missing here. Also, a 2-Factor Authentication login would be welcomed as a security improvement. All in all, a great place to start trading cryptocurrencies. FXStreet aims to provide useful and reliable information about third parties and companies but terms may change frequently. Despite our best efforts, it is possible that some information may be out of date or contain errors. We recommend consulting their official website. We may also include affiliate links from other websites, however we are not responsible or liable for any actions of other websites. Investing in Cryptocurrencies involves a great deal of risk, including the loss of all your investment, as well as emotional distress. Singularity-X offers individuals and institutions the ability to trade digital assets such as Bitcoin, Litecoin, Ethereum, and DASH. Buy/Sell Bitcoin with 0% fee.